Happy Publication Day to my ebook, Dear Agent! I know my book is the most important thing. So I have made it all sparkly and wonderful. But now I have to write you a letter which will make you see how sparkly and wonderful it is, so that you will be desperate to read it. I would have done something really cute and original, such as sending you some toffees or filling the envelope with confetti or turning up on your doorstep on a Saturday evening to hand deliver it while singing “Oh, what a wonderful day!” and dressed as Gollum. But then I read Dear Agent, the frabjous new ebook by Nicola Morgan, and she showed me that while my book must be sparkly and wonderful, the letter only needs to be sensible and clear and get right to the core of my book. Frankly, dear agent, I think you owe an enormous debt of gratitude to Nicola Morgan because if I hadn’t read her book I’d have made at least a dozen eye-bleeding errors and you and all your agent friends would be (rightly) laughing at my silliness. She really is a complete marvel and I feel it's only right that you should send her a case of champagne and some chocolates from Coco of Bruntsfield. Or, if you can't manage the champagne, Sainsbury's do a lovely pink Cava which I happen to know she's partial to. Very partial. In fact, tbh, we're talking flagons here. Or, if you can't even manage that, dear lovely agent, just tell everyone to buy her sodding books. All of them. But especially this one. Because it will save you from a complete dollop of eel vomit stickying up your letter-box or email inbox. And now, back to writing that letter to show you how sparkly and wonderful my book is. I'm going to do it now. Really. And I promise not to send it while drunk. Readers, I need you. I really do. Pleeease help me shoot it up the charts with a resounding thwack. Amazon UK / Amazon.com / Lulu later. Please consider buying it and if you like it, please consider giving it an Amazon review. I will be more grateful than you can know. American readers, too - this book and Write a Great Synopsis are for you, as well! At the party, we will be playing #DearAgentFail, in which you will be able to suggest all the things NOT to do or say in your submission. More details nearer the time. Sorry not to be able to make the party tonight, but I'm sure this it will be a great success. 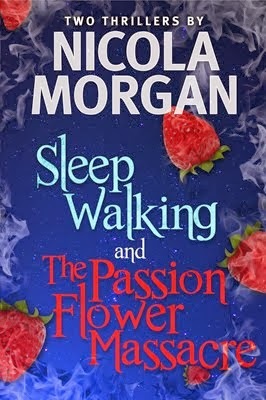 From my point of view it has the usual Nicola Morgan mix of easy to read and incredibly sensible advice. Thank you for writing it and here's hoping for lots of sales for you. Yay! Congratulations Nicola. Just what we're all in need of. Congratulations Nicola. Downloaded it yesterday because I couldn't wait.Halfway through and enjoying it enormously. A worthy follow up to'Write to be Published' which I recommend to everyone who has ambitions to be published. Thank you for your practical and straightforward take on the process. See - told you it would be purr-fectly all right. You humans do worry unnecessarily. I told you it would be absolutely amazing. Now, have I earned some tuna? And now, let us all eat chocolate! What about people who aren't in the UK? Why do we have to pay $3? Miriam - I'm really sorry but the way it works is that Amazon works out the relative prices. I simply set it to the absolute cheapest it can be in one currency and it works out the others. I have no idea why it's $3 - it certainly shouldn't be. It's set at 99c in the US, because I specified that, but I have no control over everything else. The price will go up to the equivalent of around £2.70 after the weekend. I'm so sorry. It makes me sad that you are disappointed in the price, but I have honestly done everything I can to make it the cheapest Amazon will allow in all currencies. I wanted to make it around 50p, but that wasn't physically possible. Re non-uk prices:Oh that authors had ANY control over how Amazon's pricing structure works! I guess 77p is about $1.20 in Australia, isn't it? It's clearly been discounted a bit then, as the full price (£2.70) would be about $4 Australian but isn't it irksome (for Nicola as much as anyone I imagine!)? I don't think the people doing the pricing realise that it has an impact on readers and authors who are selling their books successfully internationally! Anyway, hurrah that Nicola is selling it to us at any sort of discount for now! And I'm sure anyone who's read it agrees it's well worth more than the full price anyway. OK - sorry I mentioned this. I've never bought a kindle book on Amazon before. It's possible that all non-free books cost an extra $2 here. Mea Culpa Miriam! You're not even in Australia! Anyway, how about I help you to a drink of virtual champagne at Nicola's Dear Agent Twitter launch tonight? Congratulations Nicola. I've bought my copy and dipped into it. It is invaluable. Thank you. I'm at your party in spirit (ha, ha), because I have a supply here. Cheers. Have bought it and will leave my Amazonian delightedness under my "other" name. Now can we have the howlers posted for the party last night as a "How NOT to approach an Agent please?" I can offer genuine Swiss chocolate if that's of any use? Feel I owe you that anyway after all your help. I am sooo excited about my new book Dear Agent. I have never bought an ebook before because I don't have a kindle. My desire for Dear Agent was so overwelming that I have now conquered my techno phobia and down loaded the Free Kindle App on to my PC. Thanks Nicola! Off to read it now. Hope its a great sucess! Right, I'm off to buy a copy of Dear Agent, now. Anon (JT) - what a lovely, excited comment! I hope it's very helpful to you. David, Jan, Katherine, Fiona - many thanks, as ever. I do hope you enjoy it. Cameron - it's tempting to put the howlers in a book but a) they would be the words of other people and it wouldn't feel right to create a book out of them and b) it alos wouldn't feel right to profit from the howlers of others! I have just gone and bought a copy; can't wait to read it.